Havkraft – Ocean power. Invented. Quote: “It has been shown that depending on the efficiency of the damping by the turbine system energy up to 35 % can be extracted from the waves on individual periods. This means that when exposed for an irregular wave spectrum this system will be able to extract more energy than traditional OWC systems as the Havkraft system responds to a broader spectrum of frequencies”. – Dr Karl Christian Strømsem, Global Maritime. We believe the world needs a mix of various energy sources. In this mix wave power is one of the most important ones, being a «natural battery» producing energy even after the sun has set and the wind has calmed. 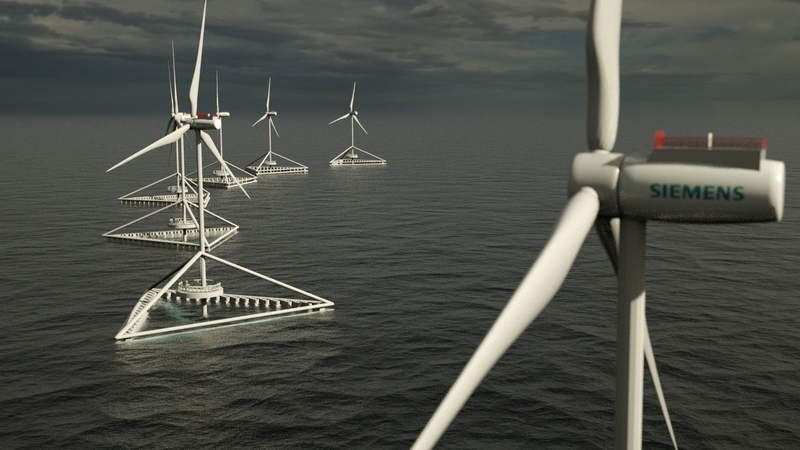 Putting wave energy converters into hybrid solutions at sea is the name of the future game. Combined with batteries, diesel fuel can be replaced and CO2 emissions be reduced locally on offshore vessels and platforms. This is one of many ways to utilize local wave power in the following years, all the way up to stand alone wave power plants producing electricity to the national grids world wide. Integrating H-WECs in hybrid systems reduce both capital expenditure (CAPEX) and operational expenditure (OPEX) – and in the end it’s all about secure delivery of energy at an acceptable energy cost. It’s clear for all to see that H-WEC hybrids give more bang for the buck! Havkraft is a Norwegian technology company which have developed and multi-patented the Havkraft Wave Energy Converter (H-WEC) – a world leading wave energy converter. The development started by founder and inventor Geir Arne Solheim already in 1998, and in 2009 Havkraft AS was formally established as a cooperation. Current owners are founder Geir Arne Solheim, Fjord Invest, Stadpower, Ulvesund Elektro, Kvernevik Engineering and Frequency. Our main office is at Maritim Park at Raudeberg, close to the maritime city of Måløy, Norway. Havkraft finished in July 2015 a successful 16 MNOK prototype test project with a 200 kW full scale power plant with over 4500 hours continuously running hours in test phase 2. In 2016 we passed threshold in a H2020 project, together with European players such as Electro de Portugal (EDP), WaveEC, Global Maritime, Sintef Energy, Sintef Ocean, Ålborg University, Technico Superior, Gent University, JustASK and Kymaner, alongside Havkraft’s owners. In 2017 the first commercial contract was signed for a 1 MW solution in coooperation with HydroWave AS. Today Havkraft have 27 active patents world wide. The modul based H-WEC-system can be perfectly integrated in hybrid-solutions, to give marine renewables more bang for the buck! With the successful deployment of our full scale offshore floating wave power plant in Q4 in 2014, and our successful prototype testing finished in Q3 2015, we are front runners in the industry. Customers, energy companies and industrial partners are welcome to contact us at any time concerning ways of cooperation. Todays owners are Geir Arne Solheim, Fjord Invest, Stadpower, Ulvesund Elektro, Kvernevik Engineering and Frequency. Havkraft is supported by Innovation Norway and The Norwegian Research Council. Please contact CEO Geir Arne Solheim for investor realations: geir@havkraft.no +47 95 75 19 92.